"Today's Weather". U.S. SOF, Albanian SOF, and Lithuanian National Defence Volunteer Forces (KASP) conduct combined operations during Allied Spirit VIII at Joint Multinational Readiness Center in Germany. (photo by SGT Karen Sampson, SOCEUR, Jan 20, 2018). SOF News Update 20180309 – DoD and Hollywood, Germany in Afghanistan, Niger incident, new Army sniper rifle, US SOF in Panamanian JCET, expanding SOF, “Gallant Phoenix”, EUCOM commander testimony, RAND paper on deployments, new cdr for 24th SOW, history of U.S. Army Rangers, and more. DoD and Hollywood. An article by the Defense Department says that it has armed forces Hollywood liaison offices to help the movie industry accurately display military stories, make sure sensitive information isn’t disclosed, and to coordinate for the use of military equipment and installations. Read more in “How & Why the Defense Department Works With Hollywood”, DoDLive, February 28, 2018. Niger – Hostile Fire Back Pay. The four U.S. soldiers who were killed in Niger in an ISIS ambush are now eligible for back pay while serving under hostile fire. The Imminent Danger Pay is an additional $225 per month. Military personnel serving in Niger, Mali, and parts of Cameroon will now get the extra pay – and it is retroactive to June 2017. Other countries are already considered hostile fire pay areas – Eritrea, Ethiopia, Kenya, Somalia, and Sudan. (NBC News, Mar 7, 2018). Africa – “The Tyranny of Geography”. SOF and conventional small units are currently dispersed all over the huge continent of Africa. AFRICOM, SOCAFRICA, CJTF-HOA, and other organizations are continually evaluating contingency plans for MEDEVAC, QRF, CAS, ISR, and Personnel Recovery. Read more on the difficulty of this huge task and responsibility in “This Is One of the Biggest Reasons Why The Deadly Ambush in Niger Won’t Be The Last”, by Jared Keller, Task & Purpose, March 8, 2018. US SOF in Panamanian JCET. Members of the U.S. special operations community recently conducted a Joint Combined Exchange Training (JCET) event in Panama with Panamanian counterparts. Panama units included the National Police Counterterrorism Unit (UFEC), National Police Rural and Maritime Anti-Drug Unit (UTOA), and elements from the National Aero Naval Service (SENAN). 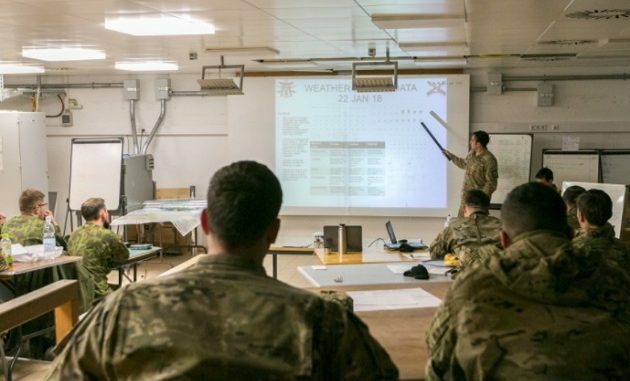 Read more in “Training boosts US response capabilities in the Americas”, DVIDS SOCSouth, March 8, 2018. Gallant Phoenix and Belgium. Belgian defence sources have confirmed Belgian participation in an operation that collects information on ISIS in Syria and Iraq and uses it to conduct operations. (Flanders News.be, Mar 8, 2018). New Cdr for 24th SOW. The Air Force’s only Special Tactics Wing is getting a new commander. In the last two years, under the outgoing commander, the 24th SOW personnel have conducted almost 2,900 combat missions, more than 180 airfield surveys, engaged in combat around the world. See “24th SOW welcomes new commander”, DVIDS, March 8, 2018. RAND Paper on Deployments. Since 9/11, 2.77 million service members have served on 5.4 deployments. the average length of deployment varied across the services; multiple deployments were not uncommon. Read Examination of Recent Deployment Experience Across the Services and Components, RAND Corporation, March 2018, 12 pages. Expanding SOF. Eric P. Shwedo, a career SOF officer, writes about how Army Special Operations might prepare to expand in the event of a major war by resolving impediments to growth, improving recall procedures, and developing plans to expand training capacities. “Expansibility and Army Special Operations Forces”, Parameters, U.S. Army War College, Winter 2017-2018, Vol. 47 No. 4, (12 pages). EUCOM Cdr’s Testimony to Senate. Army General Curtis Scaparrotti, the commander of U.S. European Command and Supreme Allied Commander Europe of NATO Allied Command Operations, provided testimony to the Senate Armed Services Committee on March 8, 2018. (DVIDS, 2 hours long). New Army Sniper Rifle. The modified HK G28 will replace the Army’s current SDMR – the M110 SASS 7.62 compact sniper rifle. It is a harder hitting rifle than the current one in uses and provides infantry soldiers with an upgraded, deadly capability – with increased body armor penetration. (Fox News, Mar 8, 2018). History of U.S. Army Rangers. The Rangers and the Army have had an on-and-off type of relationship over the last half century. This story provides a history of the Ranger units from World War II to the beginning of the GWOT. Read “U.S. Army Rangers from WW II to the War on Terrorism, 1945-2001”, Defense Media Network, March 1, 2018. Germans to Increase Troops for Afghanistan. The Germans are stepping in their commitment to NATO’s Resolute Support Mission in Afghanistan. Germany is the lead ‘framework’ nation in northern Afghanistan – in command of Train, Advise, and Assist Command – North. They will raise their troop levels to 1,300. (Reuters, Mar 7, 2018).